How adorable is this candle - This candle is scented in our Pumpkin Patch scent which is a CBV house blend and it is fabulous! 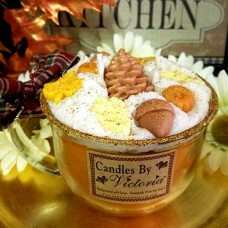 We begin with a layer of orange wax in the scent Pumpkin Patch, we then whip up a white wax topping in the same scent, we add the fragranced wax embeds of leaves, acorns, pinecones and pumpkins again in the same scent to complete this adorable Fall inspired candle. Oh and let's not forget that we edge this adorable candle in gold glitter! Our Coffee Cup Cuties come double wicked and are poured up in this adorable 18 oz. clear coffee cup and tied with a piece of homespun. Each of our Coffee Cup Cutie Candles are decorated with wax embeds and covered in sparkly glitter and triple scented in one of our popular fragrances. Super cute hence the name, these candles will brighten anyone’s day, perfect for gift giving and sure to be a hit, a must have in your candle collection.